These are all examples of common motorcycle accidents on Illinois roadways. In each of these cases, the car or truck driver can be held financially responsible for the injuries he or she caused. If you suffered serious injuries or a loved one died in a fatal motorcycle crash, contact our law office to schedule a free initial consultation. 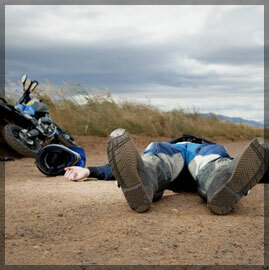 Motorcyclists suffer some of the most serious injuries due to speed and lack of protection. Knee injuries are common because the knee is the most exposed part of the body. We frequently see knee fractures and road rashes. It’s not uncommon for a biker to fly over the handlebars, in which case traumatic brain and spinal cord injuries are likely. If the biker is caught under the motorcycle as it slides on the ground, leg fractures are common, as well as road burns and heat burns. Families sometimes think that they cannot seek compensation for injuries because the biker wasn’t wearing protective gear or a helmet. That is not the case. If the other driver’s negligence caused the crash, your loved one will likely be eligible for compensation from the insurance company. We thoroughly investigate every case to prove both fault and the extent and cost of injuries. We will not let our clients get less than they deserve: see our client success stories. Contact Orzoff Law Offices today for a free initial consultation. We are dedicated to protecting the rights of injured people and to maximizing their financial recovery. Spanish and Polish language legal services are available.